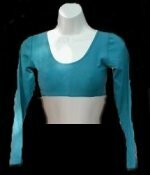 This top is not fitted as the unitards are. This top does not have an elasticized neck, arms or bottom, which gives it a loose, comfortable fit. Our loose-fitting lycra crop top is great for dance class, the gym of just to wear around town. A longsleeved version of our very popular crop top. Absolutely stunning on stage! Pair it with a skirt or harem pants for a quick practice set.